<h2>How to keep lunar samples safe</h2><br /><p>In 1969, the Apollo 12 mission retrieved a camera that had been left on the moon by an earlier spacecraft. When it was analysed, scientists discovered some bacteria – <em>Streptococcus mitis </em>– that are found in humans. While the origin of the bacteria was <a href="https://www.space.com/11536-moon-microbe-mystery-solved-apollo-12.html" target="_blank" rel="noopener noreferrer">hotly debated</a>, the incident highlighted the problem of cross-contamination – something that could invalidate the analysis of any samples brought back from <a href="https://horizon-magazine.eu/article/moon-history-museum-and-we-ve-only-visited-gift-shop.html" target="_blank" rel="noopener noreferrer">future lunar missions</a>.</p> <p>Given the potential moon and other space missions coming up in the next decade, there will also be more of a need for better ways&nbsp;of handling and analysing the material.</p> <p>One solution is to use lunar rovers to analyse the moon’s environment in situ, but&nbsp;a key challenge with this, according to Diego Urbina from Belgium-based company Space Applications Services, is the traditional huge expense and difficulty of transporting and using these vehicles.&nbsp;</p> <p>Urbina works on a project called <a href="https://cordis.europa.eu/project/rcn/205949/factsheet/en" target="_blank" rel="noopener noreferrer">LUVMI</a>, which is developing a lightweight, low-cost rover weighing about 45kg. In January, the team tested a 60kg prototype over two days in Noordwijk, the Netherlands, to see how it performed autonomously in navigating hazardous obstacles and moon-mimicking surfaces, from rugged terrain to sandy dunes.</p> <p>‘That went really well. It proved that the concept worked, that it delivered the functions we wanted it to, and the rover’s drill worked correctly,’ said Urbina. ‘We’re hoping that by the mid-2020s, if all goes well, we could have LUVMI ready for the moon.’</p> <p>The team hopes that LUVMI could be sent to look at the characteristics of the moon’s water ice – the <a href="https://www.pnas.org/content/115/36/8907" target="_blank" rel="noopener noreferrer">existence of which was confirmed last year</a> – as well as the chemicals in the crust and atmosphere, known as volatiles.</p> <p>It could also explore ways to extract oxygen and water for use by humans and as fuel by vehicles and satellites, potentially aiding future missions. ‘We expect this to be a kind of exponential effect – that once you can extract resources, these enable many things that can help you extract more resources and expand into the solar system,’ said Urbina.</p> <p><strong>Sweet spot</strong></p> <p>Urbina explained that the LUVMI rover is much smaller than traditional government-backed ones, but also larger than the more commercial miniature ones, such as those designed for Google’s Lunar XPRIZE before it was cancelled last year.&nbsp;</p> <p>‘We’re at a nice sweet spot where it is small enough that your launch costs are not too high and big enough that you can deliver a nice suite of payloads and do something interesting,’ he said.</p> <p>Rather than having six wheels like some other models, the LUVMI rover only has four, which Urbina says makes it more energy-effective while also keeping it highly mobile. This is enabled by an adjustable suspension system that allows the chassis to move up and down and more easily put sensors in contact with the lunar surface as it drives along.</p> <p>Unlike traditional rovers that transfer samples to the lunar surface after drilling into rock, LUVMI will also aim to cut analysis time in half and reduce the risk of damaging the materials by measuring them in situ rather than returning them to Earth. It will do this by drilling&nbsp;into the ground with its sampler, which uses heat to release the volatiles to be measured.</p> <p> <div class="quote-view quotesBlock quote_horizontal"> <div class="quotesTop"><img src="https://horizon-magazine.eu/sites/all/themes/horizon/images/quotes_top.png" alt="" title="" /></div> <p>‘There are many experiments where you need to actually have the sample in your hands in a lab to do them.’</p> <blockquote><p>Prof. Sara Russell, Natural History Museum, London, UK</p></blockquote> <div class="quotesBottom"><img src="https://horizon-magazine.eu/sites/all/themes/horizon/images/quotes_bottom.png" alt="" title="" /></div> </div> </p> <p>But while analysing samples on the moon could yield a certain amount of information, there’s nothing like having part of the moon in front of you to look at on Earth, says Professor Sara Russell at the Natural History Museum in London, UK.</p> <p>‘There’s lots of things that an in situ rover or orbital mission can do, but there are many experiments where you need to actually have the sample in your hands in a lab to do them,’ she said.</p> <p>Prof. Russell said this is necessary for studies such as precise isotope measurements to determine the ages or chemical history of samples, or detailed examinations of organic material to assess the possibility of life elsewhere in the solar system.</p> <p>She is part of a team that is developing a plan to build a dedicated pan-European facility to properly curate samples returned from space, protecting them from contamination and preserving them in pristine condition.</p> <p><strong>Curation</strong></p> <p>Her role, as leader of a project called <a href="https://cordis.europa.eu/project/rcn/193697/factsheet/en" target="_blank" rel="noopener noreferrer">EURO-CARES</a>, was to bring together scientists and engineers from across Europe to plan a European Sample Curation Facility (ESCF) to meet the needs of sample return missions over the coming decades.</p> <p>‘There’s a lot of commonality in what we need to do, and any European space mission will be an international venture that’s a collaboration of several different countries,’ explained Prof. Russell. ‘So it was important that we came together to share our expertise and create something that would be more Europe-wide.’</p> <p>Apart from uniting their knowledge from previous space research, the researchers looked around curation facilities on other continents, such as those of NASA and Japan’s JAXA. ‘They were brilliant in sharing their lessons learnt,’ said Prof. Russell.</p> <p>She said that any research facility should be modular, with space to add new buildings to protect samples coming from very different environments and avoid cross-contamination. ‘The rule of thumb is that samples should be kept in a similar condition to how they are on the surface of their body,’ she said.</p> <p>According to Prof. Russell, the curation of lunar samples themselves is relatively straightforward because of the half-century of legacy knowledge gained from the Apollo moon missions – making starting with the moon ‘really good, easy and doable’.</p> <p>But, she said, samples from bodies such as Mars are ‘a whole different kettle of fish’ compared with the sterile nature of the moon. There is a need to take account of the conditions of the Martian atmosphere and the possibility that bugs could be brought back to Earth. That gives them a ‘restricted’ status that involves a whole set of protocols for protection on Earth.</p> <p>This could also necessitate, for example, some kind of tent that could be erected where a sample lands for initial work before being taken to its final curation facility.</p> <p>The team estimates that building an ESCF for curating just unrestricted samples would cost between €10 million and €20 million, and over €100 million for one that analysed restricted samples too. Prof. Russell says this is a relatively small outlay given the overall cost of missions, with current asteroid sample return missions such as Hayabusa2 and OSIRIS-REx budgeted at hundreds of millions of euros and a Mars one likely to cost billions.</p> <p>The team has not yet settled on a specific site and would need to seek funding to build it as a next step. Prof. Russell says, however, that work on an ESCF should begin at least seven years before samples are likely to be returned to Earth – and with missions possibly coming back from the moon and elsewhere within a 10-year time frame from now, this may heighten the urgency.</p> <p>‘It’s brought home that we really need to start thinking about it now,’ said Prof. Russell. ‘A facility would open up a whole new area of science, some of which we don’t even know about yet.’</p> <p><em>The research in this article was funded by the EU. If you liked this article, please consider sharing it on social media.</em></p> <br /> <img src=”http://www.google-analytics.com/collect?v=1&tid=UA-40077089-1&cid=how-to-keep-lunar-samples-safe&t=event&ec=republish&ea=read&el=how-to-keep-lunar-samples-safe&cs=republish&cm=republish&cn=republish&cm1=1" /> This post <a href="https://horizon-magazine.eu/article/how-keep-lunar-samples-safe.html">How to keep lunar samples safe</a> was originally published on <a href="https://horizon-magazine.eu/">Horizon: the EU Research &amp; Innovation magazine | European Commission</a>. In 1969, the Apollo 12 mission retrieved a camera that had been left on the moon by an earlier spacecraft. When it was analysed, scientists discovered some bacteria – Streptococcus mitis – that are found in humans. While the origin of the bacteria was hotly debated, the incident highlighted the problem of cross-contamination – something that could invalidate the analysis of any samples brought back from future lunar missions. Given the potential moon and other space missions coming up in the next decade, there will also be more of a need for better ways of handling and analysing the material. One solution is to use lunar rovers to analyse the moon’s environment in situ, but a key challenge with this, according to Diego Urbina from Belgium-based company Space Applications Services, is the traditional huge expense and difficulty of transporting and using these vehicles. Urbina works on a project called LUVMI, which is developing a lightweight, low-cost rover weighing about 45kg. 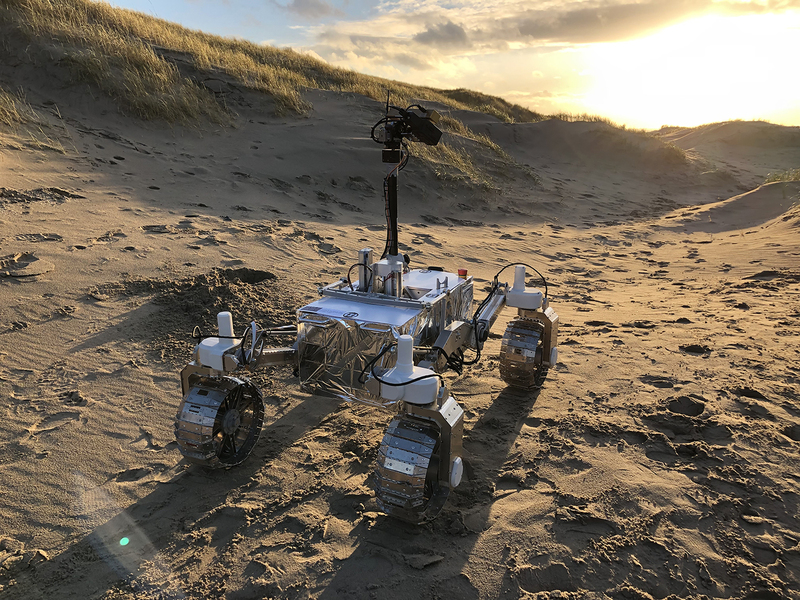 In January, the team tested a 60kg prototype over two days in Noordwijk, the Netherlands, to see how it performed autonomously in navigating hazardous obstacles and moon-mimicking surfaces, from rugged terrain to sandy dunes. The team hopes that LUVMI could be sent to look at the characteristics of the moon’s water ice – the existence of which was confirmed last year – as well as the chemicals in the crust and atmosphere, known as volatiles. It could also explore ways to extract oxygen and water for use by humans and as fuel by vehicles and satellites, potentially aiding future missions. ‘We expect this to be a kind of exponential effect – that once you can extract resources, these enable many things that can help you extract more resources and expand into the solar system,’ said Urbina. Urbina explained that the LUVMI rover is much smaller than traditional government-backed ones, but also larger than the more commercial miniature ones, such as those designed for Google’s Lunar XPRIZE before it was cancelled last year. ‘We’re at a nice sweet spot where it is small enough that your launch costs are not too high and big enough that you can deliver a nice suite of payloads and do something interesting,’ he said. Rather than having six wheels like some other models, the LUVMI rover only has four, which Urbina says makes it more energy-effective while also keeping it highly mobile. This is enabled by an adjustable suspension system that allows the chassis to move up and down and more easily put sensors in contact with the lunar surface as it drives along. Unlike traditional rovers that transfer samples to the lunar surface after drilling into rock, LUVMI will also aim to cut analysis time in half and reduce the risk of damaging the materials by measuring them in situ rather than returning them to Earth. It will do this by drilling into the ground with its sampler, which uses heat to release the volatiles to be measured. But while analysing samples on the moon could yield a certain amount of information, there’s nothing like having part of the moon in front of you to look at on Earth, says Professor Sara Russell at the Natural History Museum in London, UK. ‘There’s lots of things that an in situ rover or orbital mission can do, but there are many experiments where you need to actually have the sample in your hands in a lab to do them,’ she said. Prof. Russell said this is necessary for studies such as precise isotope measurements to determine the ages or chemical history of samples, or detailed examinations of organic material to assess the possibility of life elsewhere in the solar system. She is part of a team that is developing a plan to build a dedicated pan-European facility to properly curate samples returned from space, protecting them from contamination and preserving them in pristine condition. Her role, as leader of a project called EURO-CARES, was to bring together scientists and engineers from across Europe to plan a European Sample Curation Facility (ESCF) to meet the needs of sample return missions over the coming decades. Apart from uniting their knowledge from previous space research, the researchers looked around curation facilities on other continents, such as those of NASA and Japan’s JAXA. ‘They were brilliant in sharing their lessons learnt,’ said Prof. Russell. She said that any research facility should be modular, with space to add new buildings to protect samples coming from very different environments and avoid cross-contamination. ‘The rule of thumb is that samples should be kept in a similar condition to how they are on the surface of their body,’ she said. According to Prof. Russell, the curation of lunar samples themselves is relatively straightforward because of the half-century of legacy knowledge gained from the Apollo moon missions – making starting with the moon ‘really good, easy and doable’. But, she said, samples from bodies such as Mars are ‘a whole different kettle of fish’ compared with the sterile nature of the moon. There is a need to take account of the conditions of the Martian atmosphere and the possibility that bugs could be brought back to Earth. That gives them a ‘restricted’ status that involves a whole set of protocols for protection on Earth. This could also necessitate, for example, some kind of tent that could be erected where a sample lands for initial work before being taken to its final curation facility. The team estimates that building an ESCF for curating just unrestricted samples would cost between €10 million and €20 million, and over €100 million for one that analysed restricted samples too. Prof. Russell says this is a relatively small outlay given the overall cost of missions, with current asteroid sample return missions such as Hayabusa2 and OSIRIS-REx budgeted at hundreds of millions of euros and a Mars one likely to cost billions. The team has not yet settled on a specific site and would need to seek funding to build it as a next step. Prof. Russell says, however, that work on an ESCF should begin at least seven years before samples are likely to be returned to Earth – and with missions possibly coming back from the moon and elsewhere within a 10-year time frame from now, this may heighten the urgency.